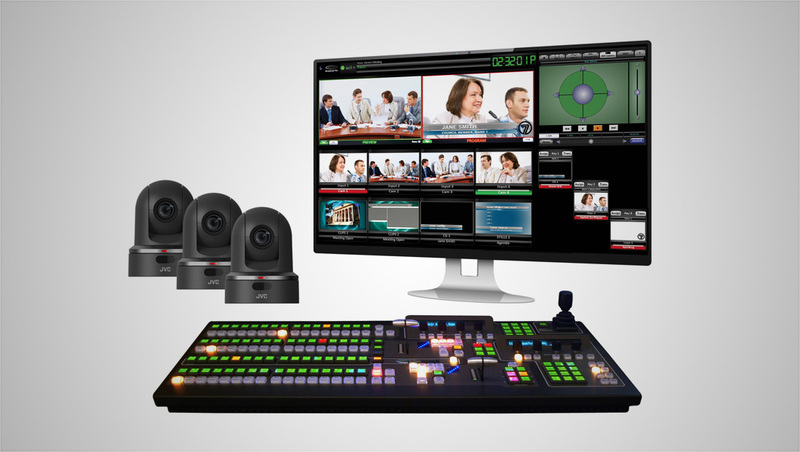 Broadcast Pix has expanded the robotic camera control via IP in its integrated production switchers to support JVC’s new KY-PZ100 PTZ network video production cameras. Each system can control pan, tilt, zoom, focus, iris, gain, and preset recall for up to 12 cameras from a remote location. JVC cameras can be controlled using the joystick on any Broadcast Pix control panel. PixButtons, Broadcast Pix’s patented control buttons with dynamic LED displays, provide quick access to up to 100 preset positions, and can set the speed and range of PTZ camera movements. The cameras can also be controlled via touchscreen using BPview, Broadcast Pix’s customizable multi-view, as well as the Broadcast Pix Commander browser-based interface on a computer or mobile device. With PoE (Power over Ethernet) technology, a single cable powers the KY-PZ100 and delivers IP video and control to a Flint™, Roadie™, or new BPswitch™ system. The new software will be available as a free upgrade for systems currently under warranty or for $995 for systems out of warranty.